Okay, okay! 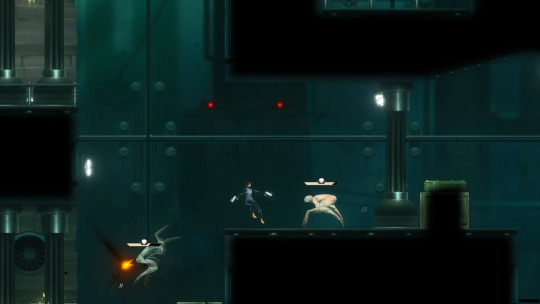 For those who don’t know, Seraph is a skill-based, acrobatic platformer. It’s an absolute jewel of an indie game. A fallen angel, Seraph, is fighting to restore her lost power and ultimately escape a demon-infested prison. Dark magic has trapped her angelic spirit inside a human Vessel. If the Vessel dies, so will Seraph. You need to shoot your way out of this underworld and return Seraph to her rightful realm. From the start, there are clues that suggest something unholy in this angel’s past. 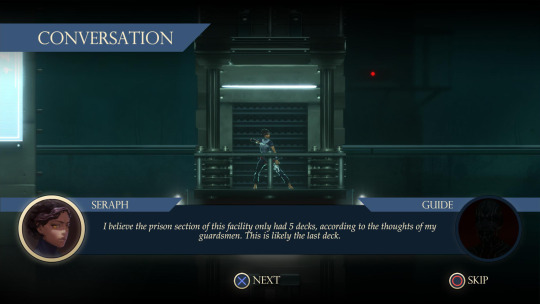 First of all, Seraph is in a prison. Her memory is also fragmented and a mysterious “Guide”, who refers to her as “Sibling”, hints that Seraph is somehow responsible for the chaos. The story unfolds as you Gun-Fu your way through action-packed levels and as the angel recovers her memory. 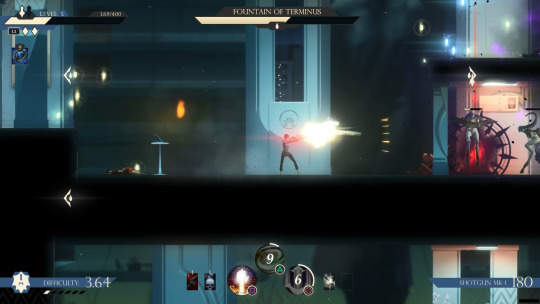 Seraph plays as a platformer. Fans of titles like Mega Man will feel right at home. Seraph’s unique feature is that aiming is automatic. You pull the trigger, but Seraph picks her own targets so you can focus on acrobatic evasion and tactics. There are loads and loads of collectibles and these aren’t for fun. As you progress, you’ll need to power up and craft new weapons and items if you intend to stand a chance against the demon hordes. The game can be played in Twitch mode, allowing viewers to vote between levels to give the Streamer a positive or negative modifier, which then actually alters the game! Objectively (which means we’re not speaking from excitement), the gameplay diversity is off the scales. Bravo! The game looks like what it feels like. The environment definitely immerses you in a dark sci-fi setting and conveys the urge to escape. Nothing to amaze you here but absolutely nothing to disappoint you either. You play to the tune of upbeat, electronic pulse music reminiscent of a Matrix action scene. This is satisfying. But we do have hopes that in some future update we get some symphonic, Gothic metal to add to the apocalyptic vibe of battling demons! Oh yes. Here Dreadbit impressed us once more with procedurally generated levels. There’s nothing like starting a level over and finding it different. Enemies displaced. Collectibles redistributed. The satisfaction of being able to approach with fresh tactics and new exploration. The game also has daily and weekly challenge leaderboards that allow you to compete with other players. Pro-Gen levels, leaderboards, and early access? We’d say you can safely bet that you’ll be coming back to this title quite a few times. Angelically Divine. We love Seraph (pick up the season’s best deal). You’ll have an amazing time blasting through levels, powering up your character, and enjoying the story-line. For any indie game platform lover, here’s a collector’s item.